The Iron, TIBC & Ferritin panel measures the ferritin, total iron, iron saturation & TIBC blood levels to help check for an iron disorder. What is tested in the iron, TIBC & ferritin panel panel? The iron, TIBC and ferritin panel measures the ferritin, iron, iron saturation & TIBC blood levels. Why are markers from the iron, TIBC & ferritin panel important? The iron, TIBC and ferritin lab panel provides a more detailed screening of iron availability in the body. This Iron, TIBC & Ferritin Panel is a blood test. The iron, TIBC and ferritin test panel measures the total iron, total iron-binding capacity and ferritin blood levels. This panel builds on the iron & TIBC test by adding on the ferritin test. The iron, TIBC and ferritin panel is a more detailed way to evaluate possible iron deficiency anemia or an iron overload state. For a more comprehensive assessment, some people order the iron blood test panel. To get the iron, TIBC and ferritin panel near you, just order online and get your blood drawn at Quest Diagnostics. Fasting is recommended for the iron, TIBC and ferritin test panel prior to testing. Once your iron, TIBC and ferritin lab report is ready, it will be available for download. 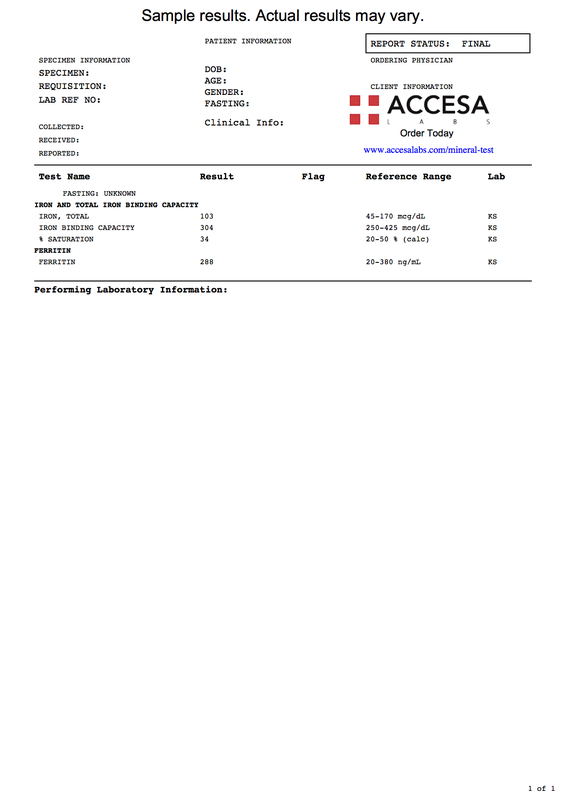 As can be seen on the sample iron, TIBC and ferritin lab report, iron, TIBC and ferritin blood levels are reported as numbers and can be compared against the reference ranges provided by the lab. Iron, TIBC & Ferritin Panel at Guaranteed Prices.